Welcome home! This three bedroom house is ready for summer! This section of Madaket beach is a 7-minute walk down from house. A view from the loft shows the wide open living room. A view of open living room and kitchen area. 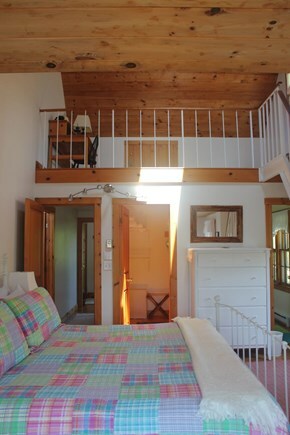 Spiral staircase leads to loft, perfect for kids. The kitchen is well-stocked with all you need. Another view of the kitchen showing the dining room that seats 8. 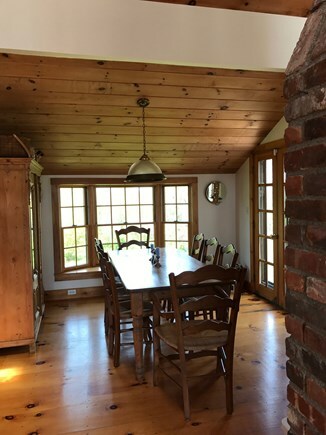 The dining room is off the kitchen and opens to the backyard. 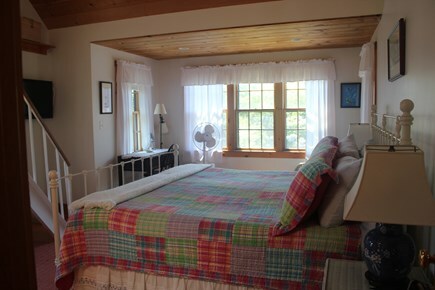 The master bedroom is spacious and inviting with lots of windows. 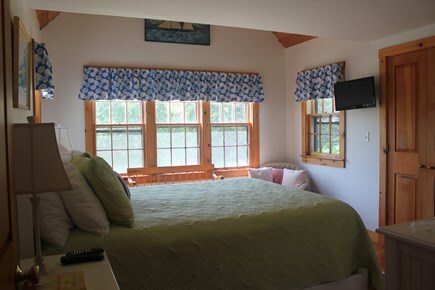 A guest bedroom with a comfy queen bed and tv. Clean and quiet. 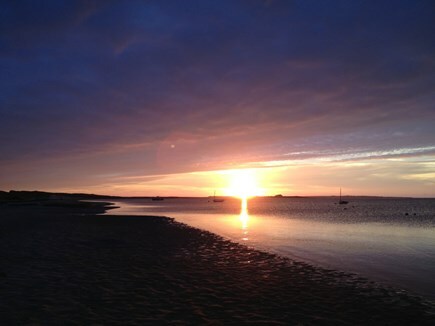 There's nothing better than a Madaket sunset. Beach: Madaket beach is a 7 minute walk from the house. 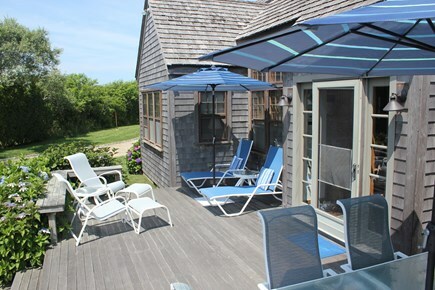 Book the best month in Nantucket– September! Crowds are gone, weather is warm, sales are on! 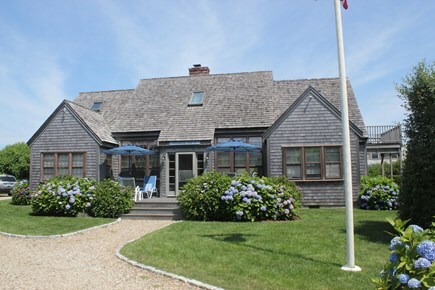 This spacious house in a quiet neighborhood is awesome for families looking to escape to a special corner of Nantucket. 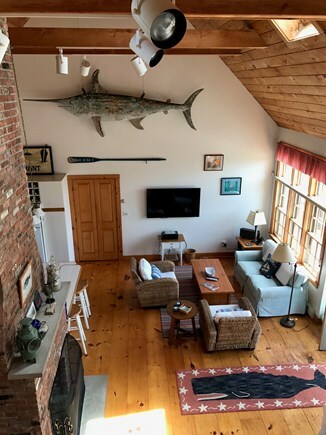 Madaket Beach is just a short walk away, there is a bike path and bus stop at the end of the street, and Millie’s Restaurant, famous for Madaket Mysteries and sunsets, is right around the corner. 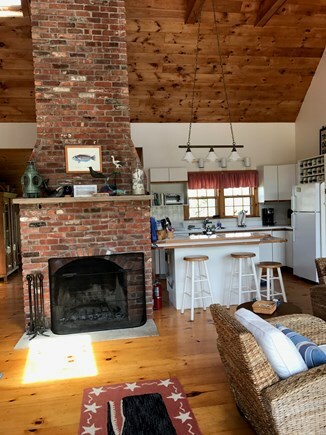 The house has a wide-open living room with soaring ceilings, a wood-burning fireplace and two seating areas, both with views of the flat screen TV and kitchen. 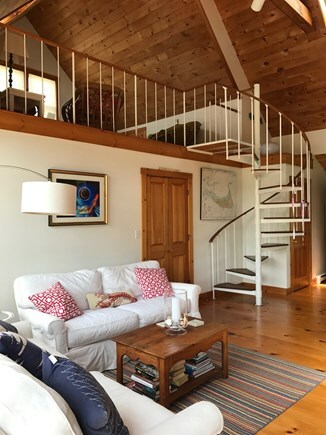 The loft off the living room with a spiral staircase is a great hangout for kids for TV, games, puzzles, and reading. The large outdoor deck is perfect for soaking up the sun or dining al fresco. 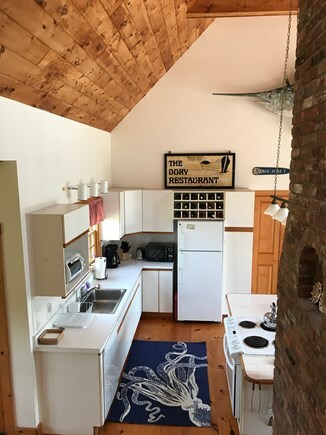 The fully-equipped kitchen has a breakfast bar and opens into a dining room that seats 8 comfortably at the wide country table. The house can sleep up to 8 people in 3 bedrooms, depending upon sleeping arrangements. A large master bedroom has a super comfy king bed, flat screen TV, walk-in closet, en-suite full bathroom, and an office loft to an outdoor deck. On the other side of the house, a spacious bedroom has a comfortable queen bed, double closets, and a flat screen TV. 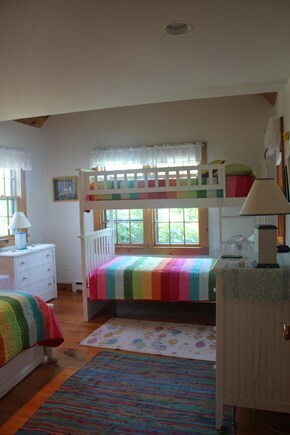 The twin bedroom is great for kids with a bunk bed, a twin bed with a trundle bed underneath, and two large closets. Both rooms share an immaculate hall bathroom with a stall shower. There are also bikes, beach chairs, beach towels and toys, a Weber grill and a large manicured yard with hammock. We offer a turn-key vacation - just bring yourselves, your flip flops, and enjoy! 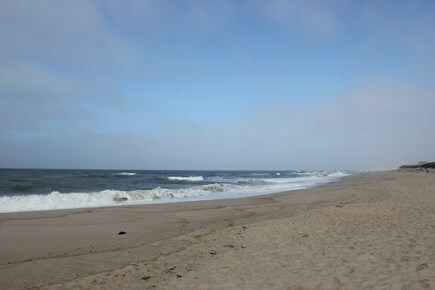 Nearest beach: Madaket beach is a 7 minute walk from the house. Additional pricing info: Non-refundable cleaning fee is $250. Refundable Security deposit is $500. State and local taxes of 11.7% will apply. Most of the house is all on one-level with smooth wood floors and rugs, but it is not set up to be handicapped accessible. 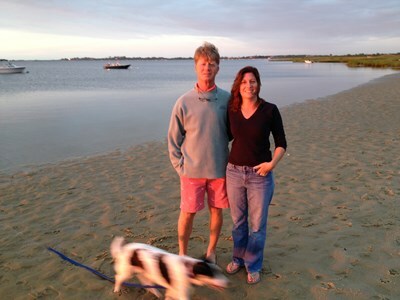 We have been coming to Nantucket in the summer for the past 19 years, first renting in Wauwinet and then buying our house in Madaket. We love the island for its clean beaches, history everywhere you turn and all the fun things to do in town. The whole of Nantucket is a very special place, and we are incredibly fortunate to have a place on the island to call our own and we are happy to share it with others. With its soaring ceilings and open floor plan, the house has a roomy feeling that is great for families. The location is perfect – within walking distance to a beautiful ocean beach but not so close that the house is cold and windy. The master bedroom is on one side of the house, while the other two bedrooms are on the other, giving each a sense of privacy. The loft is a special place for kids to hang out, watch TV or read and do board games. 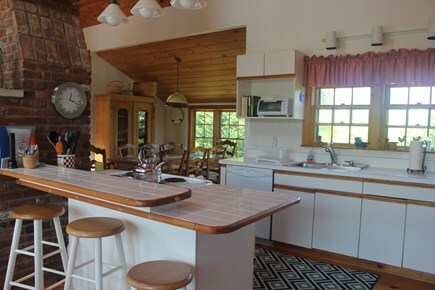 The house is completely stocked with nice quality everything – pots, pans, linens, etc. It's like a home away from home – very turnkey. Event though Nantucket is part of Massachusetts, when you're on the island, you feel like you're in a far away place. Nantucket is very unique with its historical buildings, cobblestone streets, non-chain stores and gourmet restaurants. There is always something going on on the island in the summertime and also in the off season. It's a great place for a vacation that combines relaxing at the beach with a nice time in the main town area.